Welcome to Reflections Around the Campfire! This post represents the first installment in the series detailing the second of our three cross country National Parks camping trips with kids and travel trailer in tow. “What About Now?” That song title, one of the country music group Lonestar’s popular songs from a number of years ago, pretty much summed up Alan’s philosophy and mine during our working years. As young adults, we were pretty serious and goal-oriented, but we had agreed early on that saving for the future and planning for retirement would never get in the way of living life to its fullest. Since Alan had been working for a single company since his college days, he had built up an enviable vacation allotment of six weeks per year. 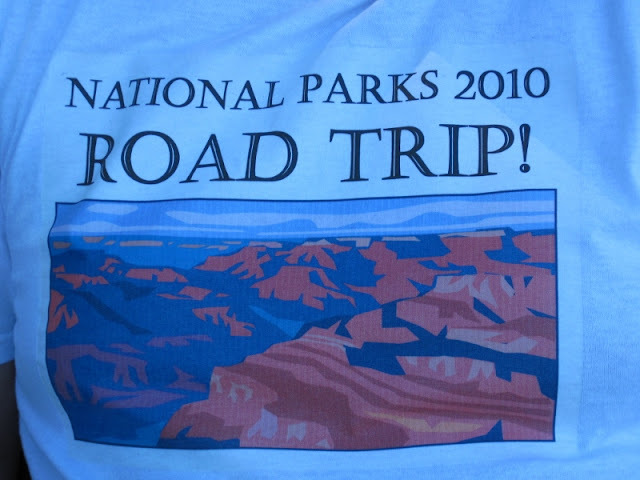 While I can’t say that his request for four solid weeks of vacation was met with enthusiasm, it was approved and our family of four set out on the second of three cross country National Parks camping trips in the summer of 2010. Our son Ryan was 16; our daughter Kyra was 11. By this time, they were both seasoned travelers, each with at least one cross continent trip to Alaska (two for Ryan) and one cross country camping trip under their belts. To have a four week block of time in which to vacation is a blessing. To fit everything you want to see and do in that four week block of time is impossible. We had already decided that this trip would focus on the National Parks of the southwest, but a decision needed to be made early on: Should we pick just one or two Parks and do them up right or should we visit more Parks, but spend less time in each? The dream of four wonderful weeks on the road was quickly replaced with the realization that, no matter what we decided, the choice would be an imperfect one and opportunities would be both gained and lost along the way. In the end, we decided that we would try to fit in as many National Parks as was reasonably possible into our allotted vacation time. Our reasoning was that getting at least a taste of a number of Parks would allow us to determine which ones would speak to our hearts and be worthy of a more in-depth return visit. That applied not only to Alan and me as adults, but also to the kids. They were old enough to know what they liked and what they didn’t – we hoped that this trip would provide food for thought and the foundation for future travels. A tribute to John Muir, one of my heroes - I know it's crooked, don't rub it in. A month long trip like this one generated an enormous planning project for me. 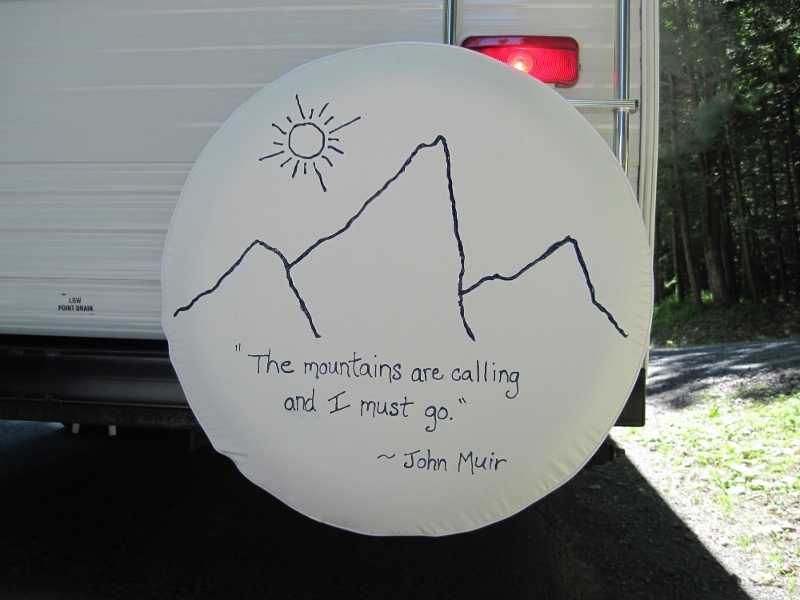 While there are many camping families who are comfortable traveling without reservations to allow for spontaneity on the road, ours is not one of them. With a trip like this one, I needed to know that we would have someplace safe in an area that we liked to lay down our heads each night. So began the task of researching Parks, activities and campgrounds covering a four week period of time. Trip planning has never been a chore to me; in fact, I enjoy it tremendously. It’s not difficult to find attractions and activities that we would all enjoy and I can easily spend hours looking at campgrounds and even specific campsites to ensure both a good fit and the best experience. Besides, if I plan the trip, I get to enjoy it twice! My non-creative self even managed to design a set of family t-shirts for the trip! Once the research and planning were completed, a departure date of July 3, 2010 was set, reservations were made and an itinerary was published. While summertime in the southwest is not the most comfortable time to be visiting that region, families working with the restrictions of school schedules are limited in their vacation choices and we had already decided that we would make the best of it. With the packing finished and the truck gassed up, we rolled down our driveway and headed west. One of the benefits of RV traveling that I absolutely love is that we’re literally steps away from our next meal. It’s simply a matter of when to stop and where to park when our stomachs are rumbling. 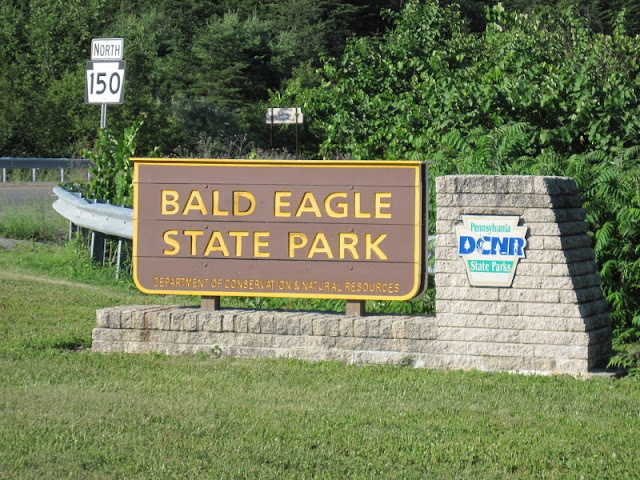 We pulled into Bald Eagle State Park in Pennsylvania, parked the travel trailer in one of the lovely picnic areas and enjoyed lunch with a view. Bald Eagle Lake stretched out before us - the 1,730-acre lake is nestled beneath Bald Eagle Mountain and surrounded by forests, fields, and wetlands. The Park was just begging to be explored, but that would have to wait for a future visit. The open road was calling and it was time to move on. Given an unlimited amount of time, our choice would be to travel the country’s smaller highways and byways, avoiding the interstate system when possible. But, with just four weeks and a lot of miles ahead of us, the interstates proved to be our friends time and time again. In general, we find that the mid-western and western states tend to be the friendliest toward RV travelers. It just seems easier to find services and amenities in those sections of the country than it does in the east. Thank you! We are happy to be here! 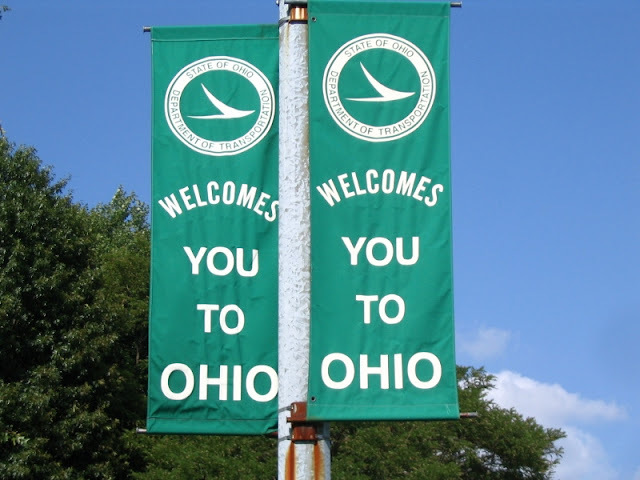 Over the years, we have found the Ohio Turnpike to be the perfect place for us to overnight either on our first day out or the last day on the road since that state is a full day’s drive from home. The Turnpike is actually Interstate 80, although I-90 does run concurrently with it for part of its 241 miles. Normally, an interstate rest area or service plaza isn’t the type of place we’d choose for a layover, but the State of Ohio provides RV services at 8 of the 14 service plazas on the Turnpike. Specifically, there is a separate, well-lit area for RV parking with electric available at each parking spot (20 and 30-120V; 50 AMP-240V), a dump station and potable water. Some service plazas have back in spots; some have pull thrus. 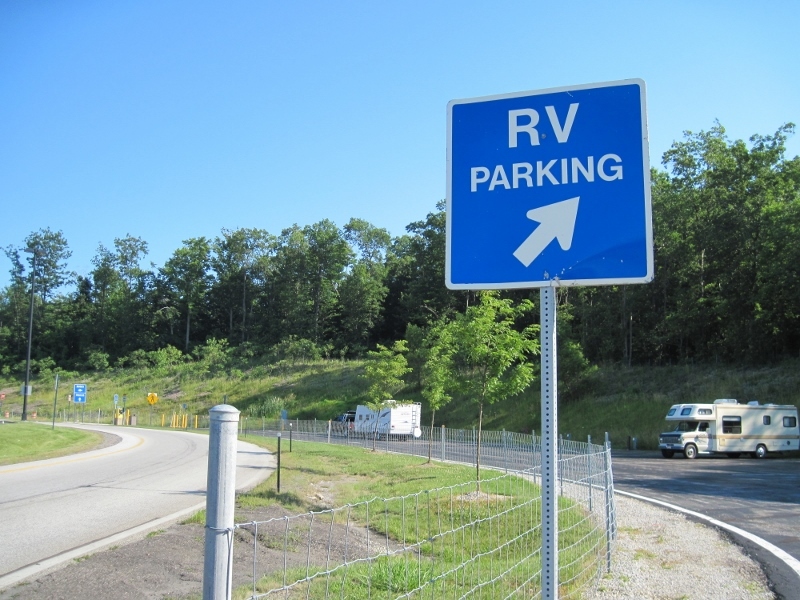 Large motor homes (especially those towing another vehicle) may have difficulty fitting in a parking spot, but the RV areas are hardly ever full and travelers seem to make do just fine. There is sometimes a picnic table or two in the RV sections but no other amenities. However, the RV spots are within easy walking distance of the service plaza buildings where food, restrooms and travel information are available. I don’t know if all 8 plazas with RV services have showers available in the main building, but at least one of them did and they were lovely according to a traveling couple we met. (We have never used them so I have no personal experiences to share.) Overnight parking in these RV sections now costs $20.00 per night which is payable at a self-service kiosk right in the RV section – no need to go to the main building unless you want to – but, if I’m remembering correctly, the kiosks accept cash only and exact change. Whether due to winter weather or lack of RV traffic (or, most likely, both), water is not available year round so dumping your tanks and taking on fresh water may not be possible depending on what time of year you’re traveling. (The water was turned off when we came through late in March of last year, but the electric was still on and the area was as well-lit as usual.) Personally, I don’t think the services provided are worth $20.00 per night for what is basically a parking place in a paved lot, but the security of knowing we’re settled down in a safe place, the ability to run our A/C if the weather is hot and the convenience of being able to dump our tanks and take on fresh water without leaving the interstate make these RV spots on the Turnpike well worth the fee to me. Keep in mind that the Ohio Turnpike is a toll road. The cost for a Class C vehicle (meaning a low, 4 axle vehicle like our truck and travel trailer combination) to travel the full length of the Turnpike is currently $27.50 using EZ-Pass and $37.75 without it. 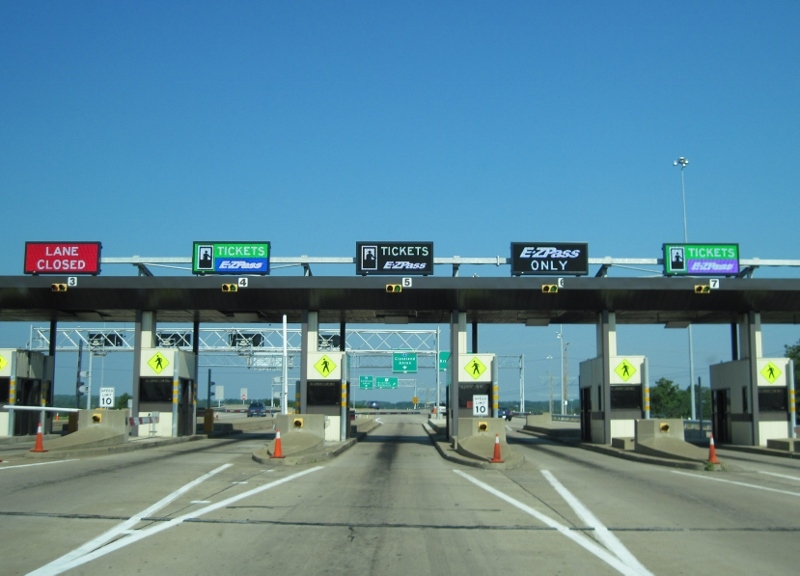 If you would like more information about the Ohio Turnpike, the link is HERE. Toll transponders speed the way - and help you forget how much you're really spending! The first day of vacation is usually a combination of excitement and impatience and the first day of this grand and glorious adventure was no exception. Unlike our 2007 cross country National Parks camping trip, we didn’t see the Wienermobile on the interstate in Ohio our first day out. But we had a safe day of travel and the RV lot on the Turnpike felt as familiar as an old friend. “What about now? Why should we wait? The next day would find us in previously unexplored country – Kentucky! 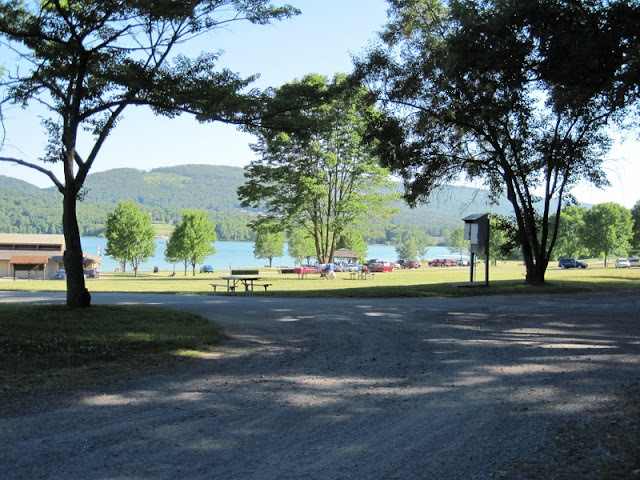 – and provide our first experience with an Army Corps of Engineers (COE) campground. I hope you’ll return for future installments and share this incredible journey with us! What fun that you're starting the tale of another National Parks trip, Mary! Looking forward to the next installment! So glad you're along for the ride, Peg! An advantage to this blog (that I wasn't thinking of when I launched it) is that now I get to enjoy our travels THREE times - once when I plan them, once as we're enjoying them and yet again when I blog about them. It's a beautiful thing! Hi Mary! Hubby and I are back from our 7-week adventure in Mexico and I have realized that I'm not getting alerts to your posts... so I'll sign up again. I grew up here in Southern California and visited many of the National Parks in the western U.S. with my family as a child. I look forward to reading about your RV trip (I've never traveled in an RV - we always tent camped). Thanks for the note, Janis! On our honeymoon, Alan and I tent camped across the country to visit a number of iconic National Parks in the west. As a concession to our formerly youthful bodies, we switched to a travel trailer when we were in our late 40's. We're really hooked on RV travel now and we're quite happy that we made the switch. Thanks for signing up for email alerts again - if you still have trouble, please do let me know. And welcome back from your 7 week adventure - it must have been magnificent! Transporting Sherman for Cruise America must have been an unusual but intriguing experience, Joe. Definitely a topic for further discussion whenever it is that we finally meet! Three months for a cross country trip sounds just wonderful - I have no doubt that you and Helen will make very good use of each and every day!